Thanks Top Flight Family for the Feature! Kauai is known as the "Garden Island," and for good reason, it is one of the wettest places on earth. Don’t worry that doesn’t mean that your upcoming visit to this beautiful island in the Hawaiian chain is going to be filled with rainy days and cold or windy conditions. Rain comes and goes and is mostly concentrated in the center of the island where Mt. Waialeale gets about 450 inches of rain each year. What it DOES mean is that you’ll witness lush rain forest and majestic waterfalls. Most people say that the best location to see Kauai’s spectacular scenery is the Na Pali Coast. This rugged coastline is so remote that getting to it takes some planning. 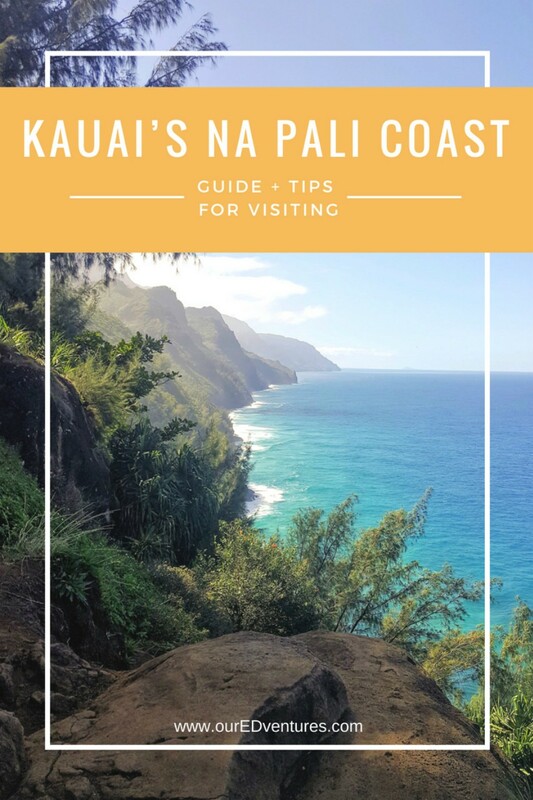 There are three ways to experience the Na Pali Coast, and some people make it their goal to try all three at least once in their life. You can experience the Na Pali Coast by helicopter, by hiking, or by boat. 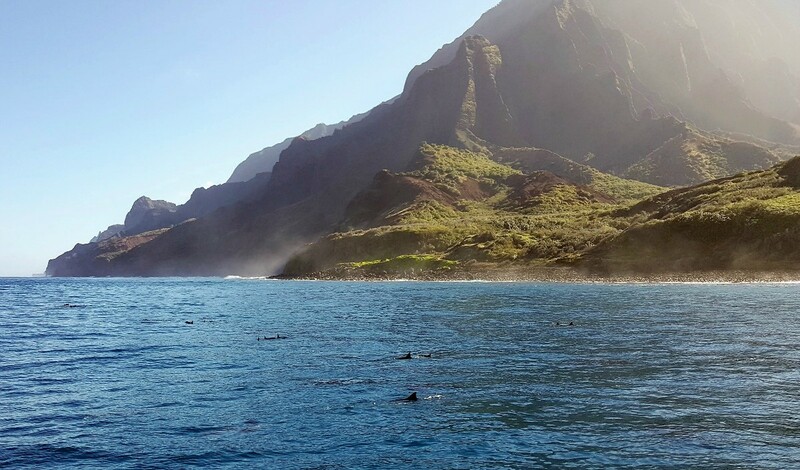 Photo credit: Captain Andy'sOn our recent trip to Kauai, we opted for the boat experience to see this vast coastline. 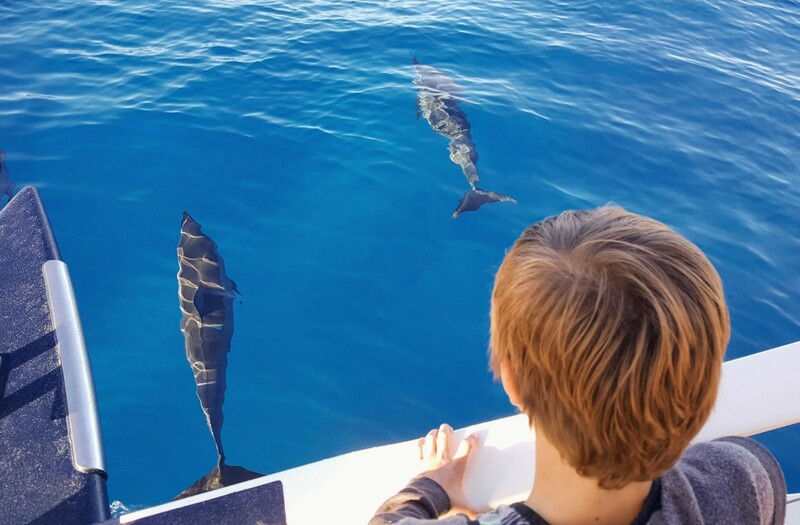 We love the ocean, sailing with the wind in our hair, snorkeling and the possibility of seeing dolphins and whales. We chose to spend the day with Captain Andy’s, and it was perfect! Everything on our wish list was checked off! 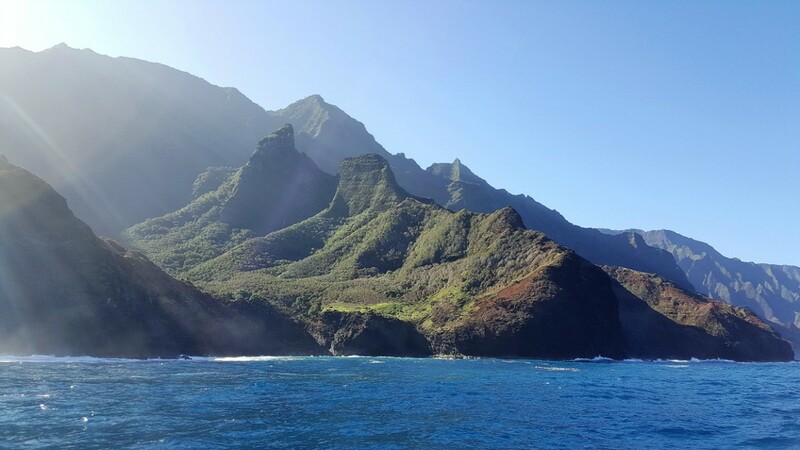 Captain Andy’s is one of the highest rated Na Pali Coast tours on Kauai. Their fleet of catamarans is sleek and luxurious. They even have raft expeditions to choose from for a more rugged and up close experience. 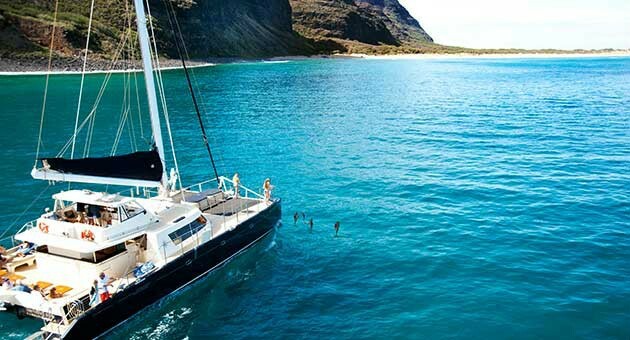 We opted for the 5.5 hour Na Pali Coast Barbeque Snorkel Tour aboard the 65’ Star Class Luxury Catamaran. Large shaded cabin areas, comfortable cushioned seating, freshwater showers, and clean restrooms are all part of this boat's features. But our family’s favorite was the open net space in the front where we could lounge on our journey. We made our booking about a month before heading to Kauai. If you are traveling in peak season, I would recommend booking your tour as early as possible to ensure you can reserve the day you want. We booked online, and it was easy and efficient. Tip: Choose your first full day in Kauai as you and your family will likely be up early anyway (if you’re traveling from the mainland USA). 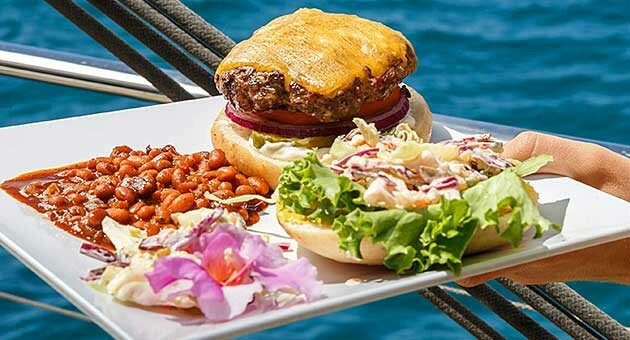 Captain Andy’s operates out of Port Allen, approximately 30 minutes west of Poipu by car. 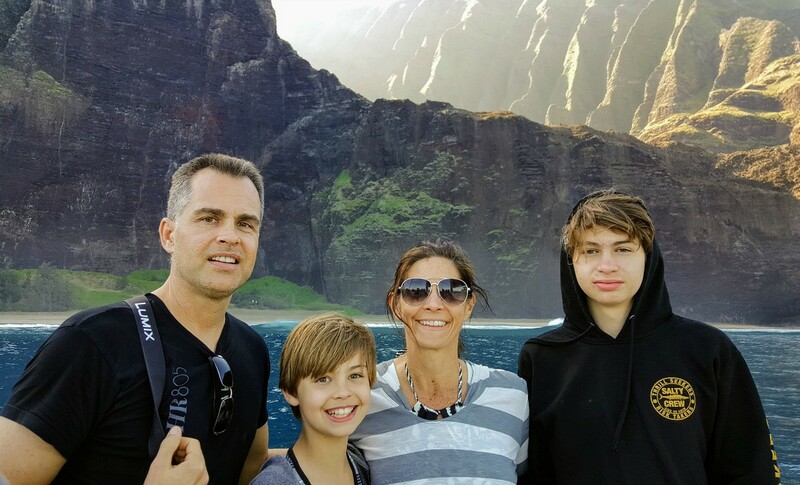 We wanted to make the most of our time in that area, so following the excursion, we visited Waimea Canyon, JoJo’s Shave Ice Shack, Captain James Cook Statue, and the Kauai Coffee Plantation all in the same day. You can read more about our time in Kauai here. Tip: Since you're more than likely not staying the Port Allen area, make the most of your drive there and plan to spend the rest of your day exploring that area. Our check-in time at Port Allen was at 7:15 am. Yep, that’s early, but as I mentioned before, it wasn’t a problem because we were still on California time (our home state) and we were up early that first morning. We left our condo around 6:30 am to ensure a timely arrival and enjoyed the beautiful drive to Port Allen. Once we arrived, finding Captain Andy’s and parking in their sizeable adjacent lot was easy. Inside, we checked-in, had some coffee, fresh fruit, and muffins. Then we waited a few minutes for the tours to get started. Lots of people joined us, not just for our excursion, but all the other trips that Captain Andy’s had going out that morning. Some instructions were given, then we split off into groups, and followed our leader down to the dock. We met our friendly crew, were given safety instructions and then it was time to pull away. Depending on weather conditions, sometimes these trips are routed elsewhere. The Na Pali Coast can be quite windy, and if the authorities determine that the conditions aren’t right, the Barbeque Snorkel Tour will head another direction. 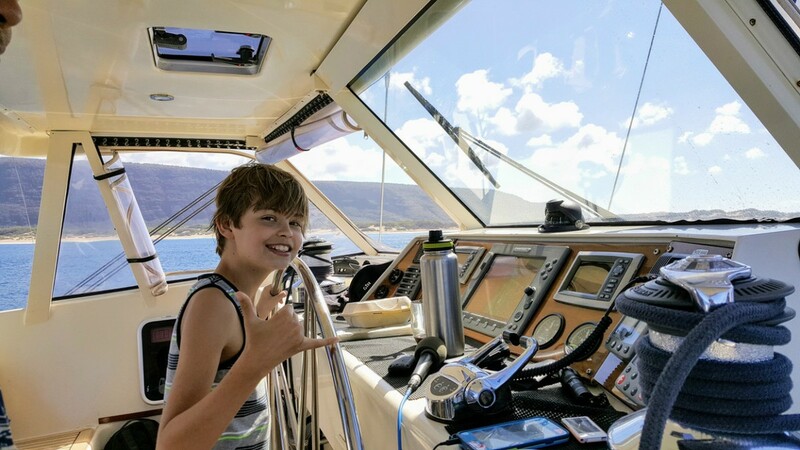 We were pleased to be heading to the Na Pali Coast! A continental breakfast was available on board. That meant more delicious Kauai coffee, passionfruit juice, little savory quiche muffin type things and fresh fruit. It was a little chilly that early in the morning, and I was glad we had brought sweatshirts along. It didn’t take long before we spotted our first pod of Hawaiian Spinner dolphins. They seemed happy to see us too! I loved that our captain pointed them out and gave us lots of information about them. Little did we know then, seeing pods of dolphins would be an experience we would have over and over again that day. We stopped several times heading up the coast to learn about various points of interest that we could see from the boat. There were waterfalls, caves, and canyons to marvel at. We even saw several humpback whales which were a total bonus! The crew was so good at keeping their eyes open for spouts of water in the distance. Every time we saw this, they stopped, pointed it out to us and talked about their migration patterns and habits. 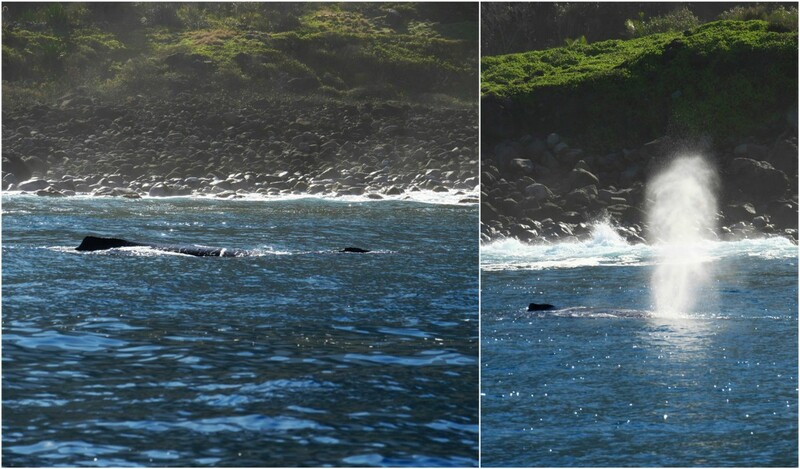 The best whale viewing of the day was when we spotted a mother and her calf near the shoreline. We kept our distance but were able to witness the two of them enjoying the warm shallow water together. After going to the end of the Na Pali Coast, it was time to turn around and begin the relaxing downwind sail back toward Port Allen. But the cruise was far from over. 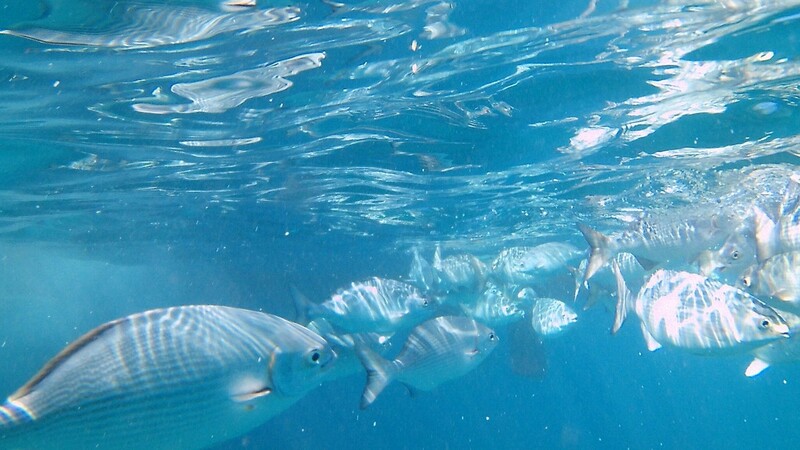 First, we stopped for some snorkeling. The crew provided equipment and instruction, and we spent about 30 minutes exploring around. Crew members, on paddleboards, were always nearby to assist with masks and keep an eye on everyone. Then it was time for our barbecue lunch. The menu consisted of grilled Makaweli beef burgers and grilled chicken burgers on homemade buns. They also had baked beans, cole slaw, and freshly baked white chocolate macadamia nut cookies. Vegetarian options are available on request. Beer, wine, and soft drinks rounded out our delicious lunch. Photo Credit: Captain Andy'sWe were down to the last hour of our tour. It was the most relaxing of all. Snuggled up in our sweatshirts and beach towels, a glass of wine in hand, the wind in our hair, and sitting out front on the catamaran’s net was how we traveled back to Port Allen. Perhaps a little salty, wind-blown and exhausted, but it was the perfect ending to a fantastic experience. Tip: Wear your swimsuit and then layer up with shorts, a t-shirt, and a sweatshirt. Bring along a hat that fits snuggly or can be tied on. Sunglasses, sunscreen, a beach towel and a camera are also useful to bring along. So now we still have a helicopter experience and a hike to plan for someday in the future. Kauai, and particularly the Na Pali Coast, is a remarkable destination that everyone should try to visit in their lifetime. Have you been to Kauai? What was your favorite experience? Disclosure: Captain Andy's generously provided our family with discounted passes to enjoy this great experience. The opinions expressed here are honest. Go for it; you'll love it!